View of Cnoc Sligeach from the west. View of Cnoc Sligeach from the north-west. View of Cnoc Sligeach from the south. 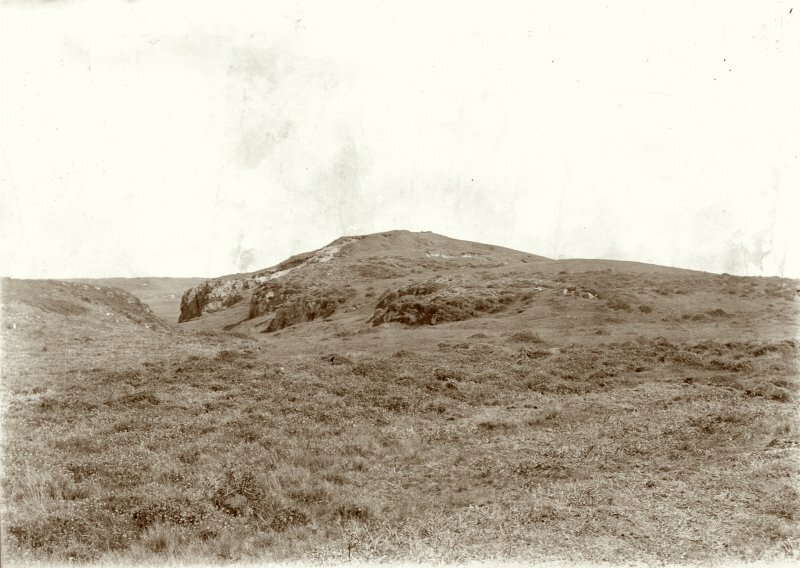 View of Cnoc Sligeach, first trench from east face. 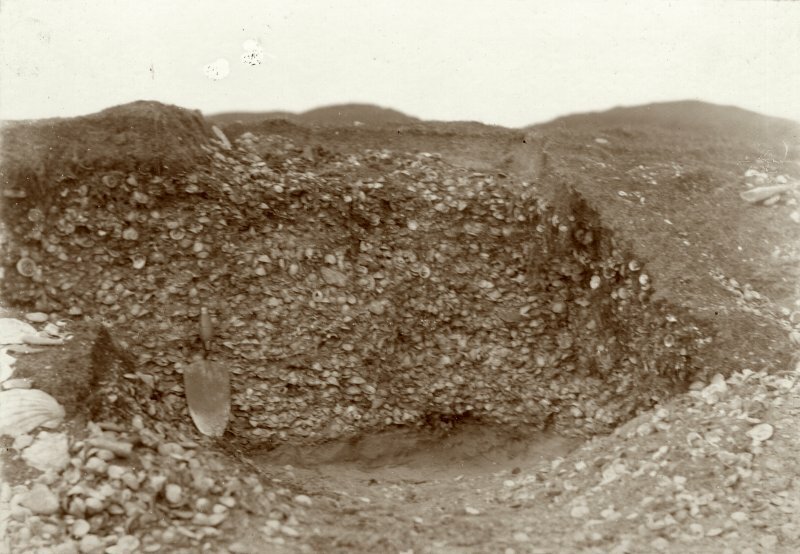 View of lower shell heap at Cnoch Sligeach with a rabbit hole under the shells. 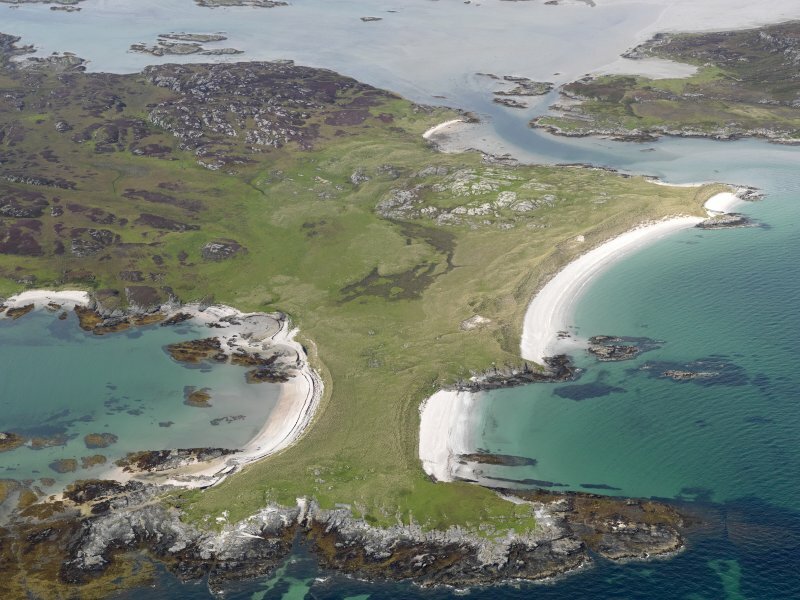 general oblique aerial view of Muran a'Chuirn peninsula, Oronsay, taken from the NE. View of the bottom of a trench at an angle of forty five degrees at Cnoc Sligeach. 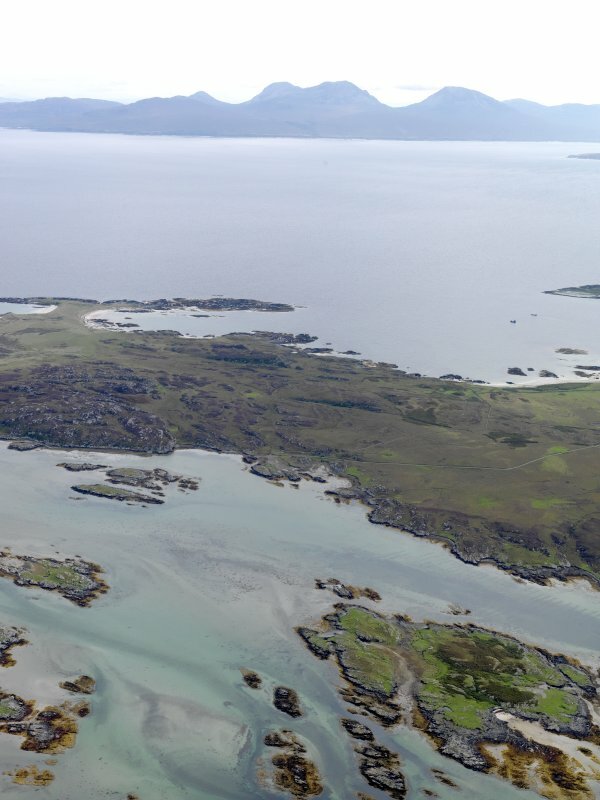 General oblique aerial view of the NE end of Oronsay looking towards the Paps of Jura, taken from the NW. (Area: NR 373 889) Mesolithic midden deposit occurs on both the summit and the eastern flank of Cnoc Sligeach - the Shelly Mound' - and excavations by W Galloway in 1884 on the summit and by Bishop in 1913 have produced a variety of implements of stone and bone as well as shells and the remains of fish, birds and animals. High up in the deposit Bishop found post-holes which could indicate shelter supports belonging to a period much later than the Obanian to which the implements are usually assigned, although Coles considers them sufficiently divergent to warrant a separate classification. Scientific study involving small-scale excavation is currently being carried out on the site by Mellars and Payne, because of its importance in preserving evidence of the economic and subsistence activities of human groups in the late pre-agricultural phase. Galloway's collection of artifacts from the site are the National Museum of Antiquities of Scotland (NMAS) and Bishop's in the Hunterian Museum, Glasgow. A large shell and some bones form the Hunterian Collection on being radiocarbon dated produced dates in the 4th to 6th millenium BC. A H Bishop 1913; S Grieve 1923; A D Lacaille 1954; J M Coles 1964; E W Mackie 1970; P Mellars and S Payne 1971. NR 3728 8909: A large grass-covered sandy mound containing much shell, measuring 38.0m N-S by 26.5m and up to 3.2m high. The excavation trenches have been backfilled. 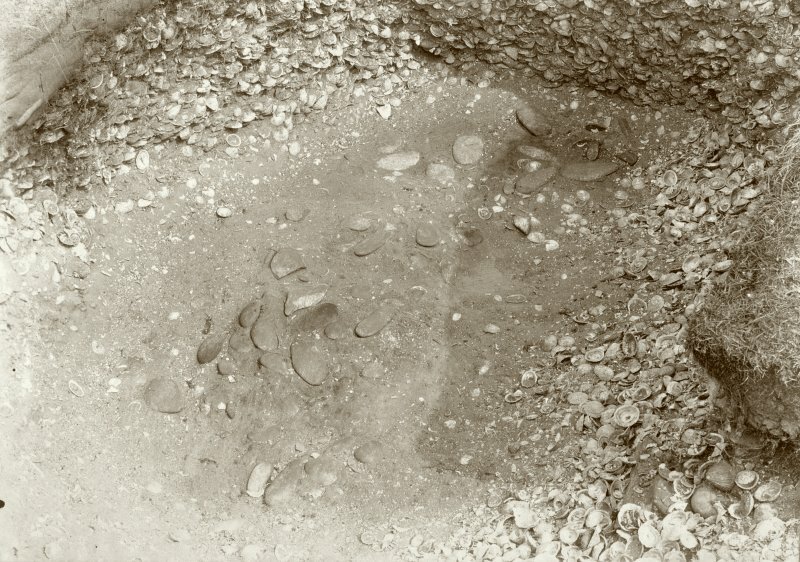 Other shell deposits occur within about a 100.0m radius of the mound. Visited by OS (DWR) 18 April 1974. The next stage of our journey through time takes us to a small island off the west coast of Scotland. The island of Oronsay sits directly to the south of its bigger brother Colonsay. Both are part of the island group known as the Inner Hebrides. 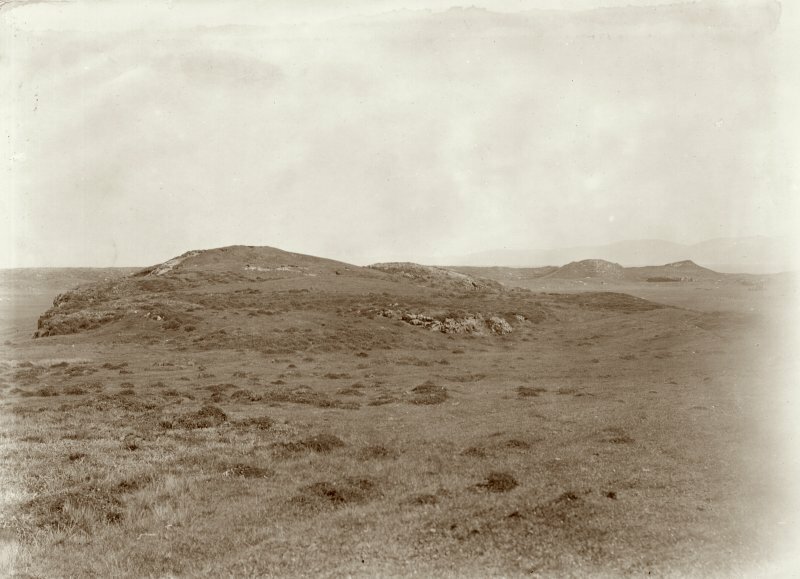 Although Oronsay is relatively small, only 5km2 in size, it is rich in archaeology. In fact, Oronsay is home to the highest identified concentration of Mesolithic sites in Scotland dating to sometime between 7000 and 5000 years ago. The Stone Age is split into three recognised phases: the ‘Palaeolithic’ meaning the old stone age, the ‘Mesolithic’ meaning the middle stone age and the ‘Neolithic’ meaning the new stone age. Much like the Palaeolithic age, there are very few known archaeological sites in Scotland that have been dated to the Mesolithic. Those that have been identified suggest that the communities moved around and survived by gathering food and hunting, likely using water as the primary method of transport. One of the main site types that have been identified are known as ‘middens’. These are large mounds made of huge quantities of sea shells and other waste material. 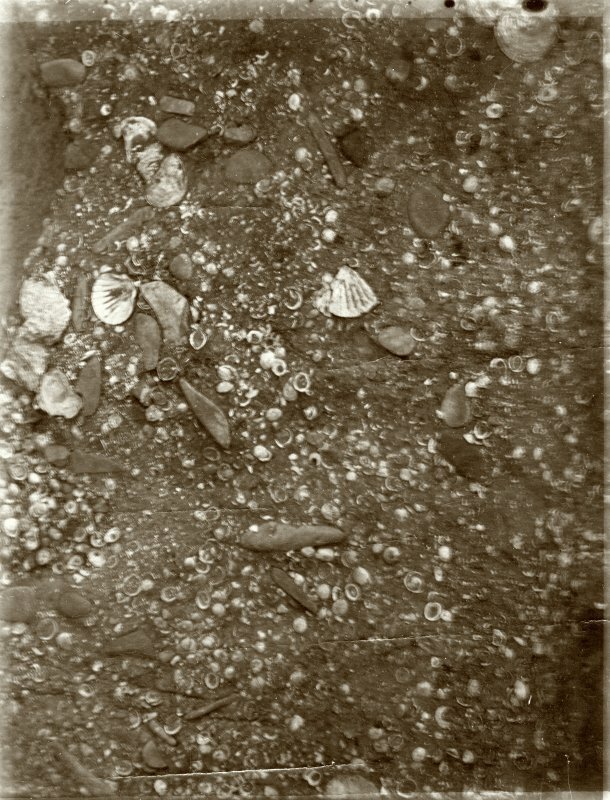 There are at least five known middens on Oronsay which include shells such as limpets, periwinkles, whelks, oysters, cockles, scallops and razorshells as well as a variety of fish. They have been found to contain very few remains from mammals that live on land or from birds. The primary type of fish identified in the Oronsay middens is from a species known as Saithe – a type of Pollock. This fish grows rapidly during the first 2-3 years of life. By examining the size of Saithe earbones recovered from the middens, archaeologists have been able to establish during which season the fish were caught at each site. Interestingly, the five middens examined across the island appear to have been occupied at different times of year. 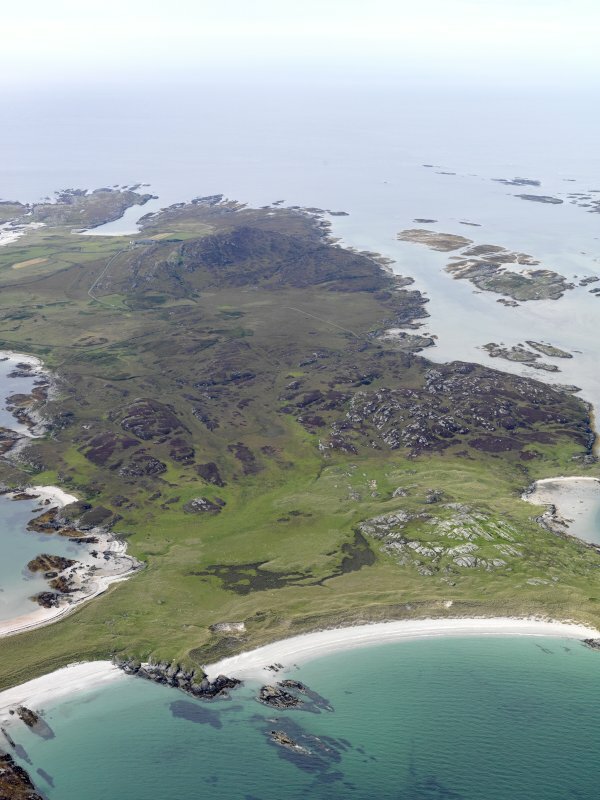 Archaeologists think that either there was one population of people living on the island who moved from place to place throughout the year, or that foragers from the mainland travelled across to Oronsay and camped at specific places in different seasons. Middens are thought to have mainly functioned as rubbish dumps, created over numerous generations through fishing or shell-gathering expeditions. However, some archaeologists have suggested that middens have other, or even multiple, purposes. Could they have been created as boundary markers between different territories? Or perhaps, as occasional human toe or finger bones have appeared at midden sites, could these be places where bodies were prepared for burial or where mortuary rituals were practiced that we do not understand today? 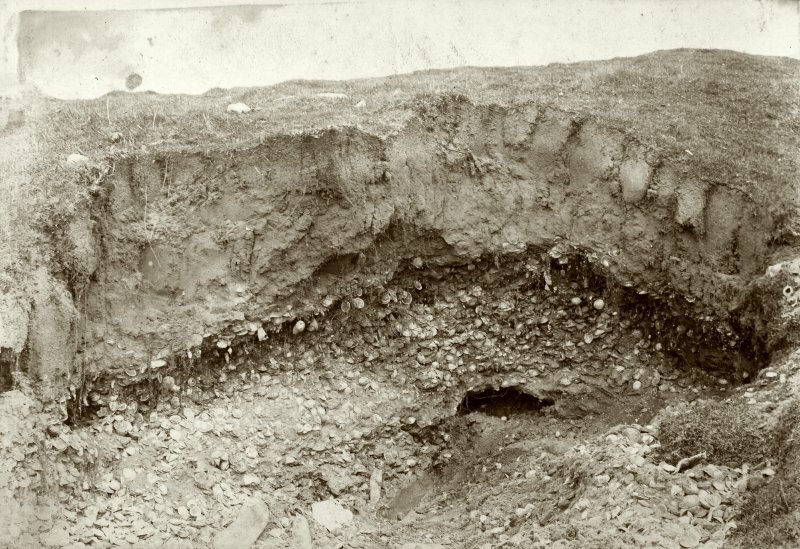 An excavation of a shell midden at Cnoc Sligeach carried out by A. Henderson Bishop with assistance from Ludovic McLellan Mann and Mungo Buchanan. 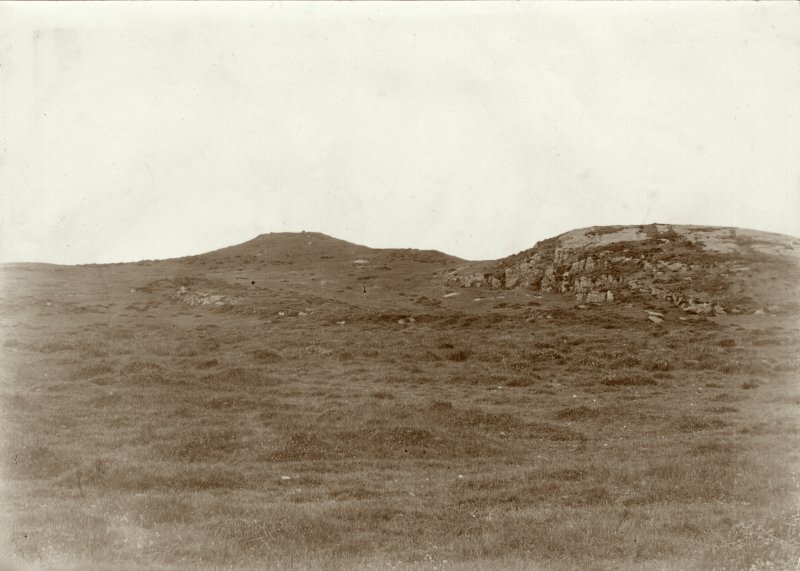 A report of the excavation by A. Henderson Bishop titled 'Oransay Shell Mound' can be found in the Proceedings of the Society of Antiquaries Scotland, Vol 48, pp. 52 - 108.